I am so in love with Thai Basil. If you can grow it or find it, get your hands on some and cook with it! 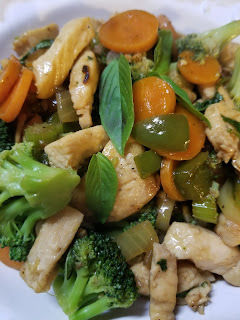 For this recipe- if you cannot find Thai Basil, sweet basil will work. Adjust the veggies so they are phase appropriate. Only use the sesame oil in phase 3. Serve over brown rice in phase 1, over Miracle Noodles in phase 2 and quinoa in phase 3. In a hot wok or skillet, brown the chicken (using oil in p3 only). Brown in small batches, and remove to plate or bowl as you cook. Stir fry the carrots, celery, onions, and garlic for 2-3 minutes, adding a bit of the stock to keep things moving. Mix the ginger, black pepper, arrowroot, tamari, lime juice and sweetener in a small bowl- set aside. Add the bell pepper, hot pepper and cook for a couple more minutes- then stir in the tamari mixture. Add stock, 1/2 cup at a time, to get the amount of sauce you like. Add chicken back in, along with basil and cilantro and steamed broccoli. Cook for 1 minute. Taste and adjust seasoning. I made this & loved it. Thanks for sharing the recipe! My new favourite FMD recipe! Takes some prep but so worth it for 4 portions. Made it without oil for Phase 2 so I can use it for Phase 1 with rice and Phase 3 with some avocado. Cooked so that all veggies were still a bit crunchy so reheating later won't kill them and that's how I prefer my veg.